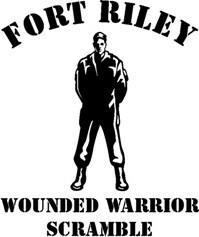 Since 1984 Barton Community College has been and will continue to be a proud supporter of Fort Riley and the surrounding area. The Wounded Warrior Golf Scramble is an opportunity to not only support our soldiers but thank them for their dedicated service and sacrifice to our country. Barton Fort Riley campus 10th Annual Wounded Warrior Golf Scramble will be held on Saturday, September 22 at Rolling Meadows Golf Course in Junction City. The tournament will begin at 9:30 a.m. Fill out the registration form by September 15. 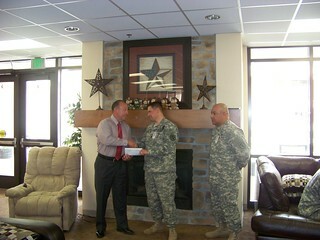 Lieutenant Colonel Eric Schmidt, Commander of Fort Riley Warrior Transition Battalion, accepts a $2,750 check from Barton Community College President, Dr. Carl Heilman on June 2, 2014. 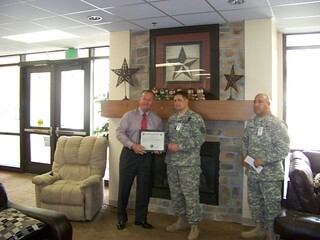 Dr. Heilman received a Certificate of Appreciation for Barton's donation. Barton hosted the 6th Annual Wounded Warrior Golf Scramble at Fort Riley's Custer Hill Golf Course on May 17, 2014 to raise funds in support of wounded, ill, or injured soldiers assigned to the Fort Riley WTB to improve their quality of life. Contact Doug Kaiser at (620) 786-1171 or kaiserd@bartonccc.edu for more information on becoming a sponsor!